As many of you know, I’m a dog lover. I love their enthusiasm, their companionship, and their loyalty. 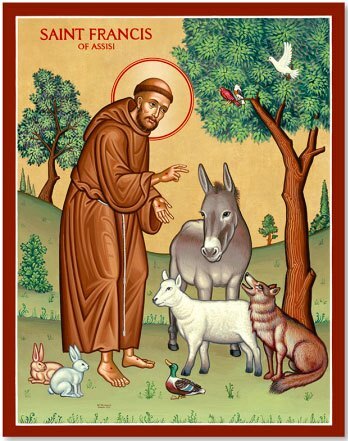 Someone else who loved dogs, and all animals for that matter, was St. Francis of Assisi. 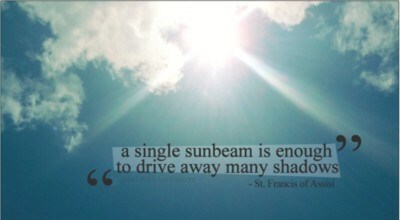 October 4 was the Feast Day of St. Francis and it’s always a favorite of mine. I loved taking Boomer to be blessed during mass last week and I always cherish our “Blessing of the Animals” chapel at work when the kids bring stuffed animals to be blessed…all in honor of the saint who loved animals. So beautiful, but what does it really say? What I love is the use of the word “sow,” as in to plant, to scatter, to spread. In other words, God, help me plants seeds of faith where there is doubt and to scatter light where there is darkness. The other thing I like is the call to be an “instrument” of God’s peace. Back when it was written, playing an instrument was considered a divine skill and instruments themselves were thought of as sacred. Think about it, to be an instrument of God’s peace. That was saying so much back then. Some versions use the word “channel” instead of instrument, which I also love. By praying “make me a channel of your peace,” you are asking to be a passage or a route toward God’s peace. Beautiful. In the end, we are all instruments in God’s plan, right? He is the great symphony and we are merely players that only together make a beautiful sound. He is our composer and we are the reeds through which His music is played. St. Francis is indeed one of the world’s most popular and beloved saints. His brown robe is known to many and his love of nature is legendary. But who was this peace loving man? Francis was born into wealth, his father being a successful merchant. Ironically his father wanted him to not be a man of God, but a man of business like himself so he changed his baptismal name of Giovanni, after John the Baptist, to Francis because he loved France and all its finery. Born in Assisi, Italy, young Francis enjoyed an easy life and was loved by all. He was happy and charming and took care of the sick but he did poorly in school and was known for his partying ways. He later enlisted to fight in the battle between Assisi and Perugia but was captured and imprisoned. While in prison, he received visions from God telling him to spread the word of Christianity and live in poverty. Upon release from captivity, Francis abandoned his life of luxury and began serving Jesus. He begged for food and shelter and told people to return to God. Seeing how close he was to God, many became his followers and later evolved into today’s Franciscan order of priests and brothers. The power of St. Francis only increased when Cardinal Jorge Mario Bergoglio took his name and became Pope Francis. A simple man himself, the pope explained his choice of a somewhat unorthodox name was inspired when his friend Cardinal Claudio Hummes hugged and kissed him and told him “don’t forget the poor” when he went over the 77 votes needed to become pope. St. Francis is considered the Patron Saint of animals, merchants, and ecology. Francis is said to have had the power of miracles and was the first person to receive the stigmata of Christ – marks resembling the wounds Jesus suffered when He was crucified. They would remain visible for the rest of his life. Francis’ ministry of telling people how much God loved them also included his love for all animals. His devotion to God’s creatures resulted in them obeying his commands, which is why depictions of St. Francis almost always include animals surrounding him. It’s also why churches worldwide conduct “Blessing of the Animals” ceremonies in October. Yet another legend about St. Francis is that we have him to thank for today’s nativity scenes. 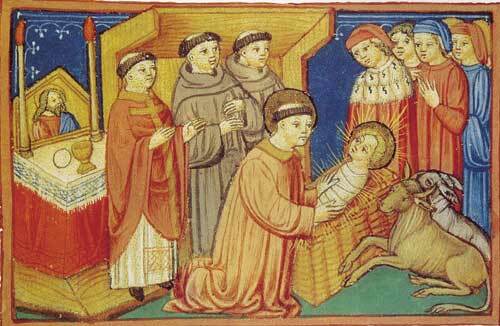 Francis is credited with creating the very first Christmas Eve nativity scene back in 1223. He had visited Christ’s birthplace in the Holy Land and was so inspired by its simplicity that he recreated it during a mass. He literally set up an empty manger inside a cave, complete with animals, in hopes of promoting more poverty-centered spirituality rather than the rampant greed and materialism that prevailed at the time. Remember, Francis at this time was devoted to poverty and seeing for himself that the King of Kings chose to be born in a humble stable amongst animals only reinforced him and his religious order to imitate these virtues. St. Francis died on October 3, 1226 and was canonized a saint less than two years later on July 16, 1228. 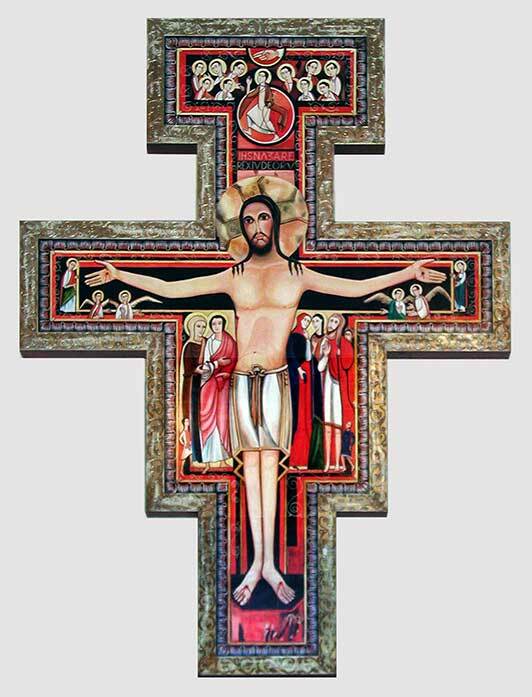 St. Francis is associated with two crosses: the San Damiano and the Tau cross. 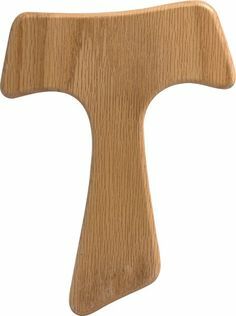 One of my most treasured objects is the Tau cross made out of Italian olive wood that I bought at The Vatican. I love its simplicity and how you can easily hold it in your hand. The Tau cross was very dear to St. Francis and today is an essential element of the Franciscan way of life. He reportedly sealed the letters he sent with it and began all of his actions with it. The last letter of the Hebrew alphabet, Tau was also used symbolically in the Old Testament. It was later adopted by early Christians who saw in it the prophecy of the Last Day much like the Greek letter Omega, as well as its cross-like form. I’ve also been given a San Damiano cross as a gift from Assisi. The cross is believed to be the one St. Francis used when he was praying. The original one hangs in Assisi’s Santa Chiarra Church in Italy. It is considered an icon because it contains images of people who took part in its meaning. Back to the Peace Prayer, which wasn’t actually written by Francis. It was first sighted on a holy card bearing a picture of St. Francis during World War I. The prayer bore no name but because of the holy card, became known as the Peace Prayer of St. Francis, and totally embodies his spirit of simplicity and charity. So after learning all of this, I revisited the prayer and have included some ways in which to not just recite it, but live it. We are the strings on which the music of God is played and the reeds through which the breath of God is blown. Show me how to sing your praises. When faced with hate, show me how to plant love. Help me seek healing and reconciliation, not approval or acceptance, so the flower of forgiveness can bloom in my soul and in the hearts of others. Show me how to minister to another’s doubt and focus on the needs of their soul. Help me be simply present where there is despair. Sometimes all someone needs is a listening ear and a kind word. Show me how to give light in darkness by not just entering another’s darkness, but by holding the door open so light can shine in. Help me bring not just comfort and solace to others but to also remember that a cheerful heart is good medicine. Let me have the courage to give what I can to help another know he is not alone. Teach me how to truly understand others and respect their dignity. Let me not yearn for others to love me but for me to love others unconditionally and for no receipt. Remind me that my spirit is nourished by giving. Show me that each day is an opportunity to forgive myself and others and to live in the freedom of being less than perfect. Allow my self-interests and negative attitudes to die so that I don’t live separate from you and remind me that not only am I promised eternal life, but that all of my words and actions have eternal life on earth.